Fence is 1.8M high and 2.4M wide. 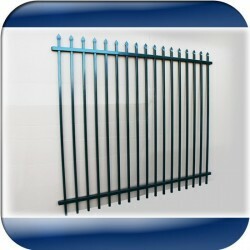 Complete fence panel is made out of steel. Surface is firstly galvanized then powder coated in dark green. Fence is 2.1M high and 2.4M wide. 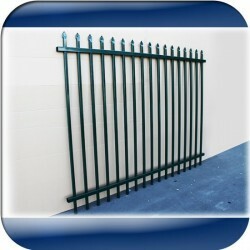 Complete fence panel is made out of steel. Surface is firstly galvanized then powder coated in dark green. 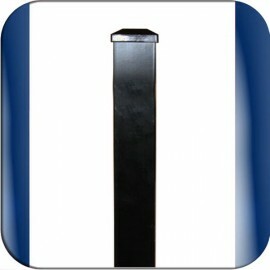 Fence post made out of aluminium and powder coated black with long lasting “DuPont” powder. Post is 2” X 2” cross-section and 2.4mm wall thickness. This post is 1.8M long and comes with a matching post cap. Fence post made out of aluminium and powder coated black with long lasting “DuPont” powder. Post is 2” X 2” cross-section and 2.4mm wall thickness. This post is 2.0M long and comes with a matching post cap. Fence post made out of aluminium and powder coated black with long lasting “DuPont” powder. Post is 2” X 2” cross-section and 2.4mm wall thickness. This post is 2.2M long and comes with a matching post cap. Fence post with base is made out of aluminium and powder coated black. Post is 50 X 50mm cross-section and 2.4mm wall thickness. This post is 1.8M long.